Pakistan Peoples Party (PPP) Chairperson Bilawal Bhutto Zardari has claimed that Nawaz League and PTI does not have a policy. 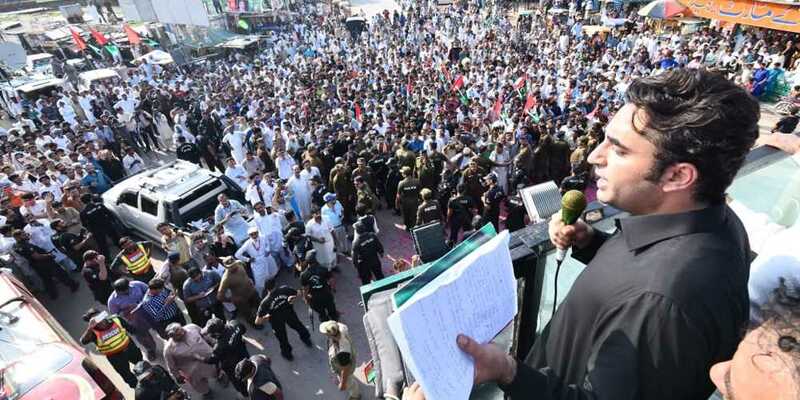 Addressing a rally at Mandi Bahauddin, Bilawal said that the Pakistan Peoples Party always had a farmer-friendly manifesto. “We will register every farmer and give them Benazir farmer card, through which their crops will be insured”, added PPP chief. Whether it is Nawaz League or PTI, both have the same economic policy and the dictators were the ones behind their creation. He said that martyred Bhutto gave a revolutionary manifesto, but I am here with another one, which will solve your problems. Peoples Party has always worked for the poor, others do not do that. The country is faced with a 60% nutrition drought, we will open food stores which will be operated by women. Politics of abuses does not give us the solution. Bilawal Bhutto said that a puppet alliance is being formed, for the upcoming election, Imran Khan is mistaken if he thinks he can become the prime minister. Through conspiracy, if he is popular and people are with him, then what is the need to provide facilities? He said that whether it is PTI or Grand Democratic Alliance (GDA), they could not compete in independent elections. Whatever the conspiracies are, we will bring evidence one day.